Pen set with Manchester City FC club crest design. Football-shaped topper and plastic clip to attach pens to your pocket. Size (approx): 15cm x 1.5cm x 2cm. 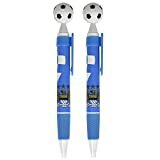 The Manchester City FC Pen Set is an official product manufactured under licence for Manchester City FC. Pen set with Manchester City FC club crest design. Rubber hand grip. Football-shaped topper and plastic clip to attach pens to your pocket. Size (approx): 15cm x 1.5cm x 2cm. The Manchester City FC Pen Set is an official product manufactured under licence for Manchester City FC. This entry was posted in Sports Kits and tagged City, Crest, Football, Manchester, Official, Pack, Wordmark by All Kits. Bookmark the permalink.